This yummy carrot cake oatmeal recipe is easy to make. You can add or subtract fruits or spices to meet your needs. Who says your oatmeal has to be boring? Oats are good for our health so add a little fruit and nuts or seeds and some spice and you have a super healthy and tasty breakfast. Have some fun coming up with new variations of this recipe. Use fresh fruit that is in season to add some variety to this recipe. Use brown sugar or honey in place of the maple syrup. You could even put this on top of other whole grain breakfast cereals. Give overnight oats a dessert-inspired twist with this carrot cake version. 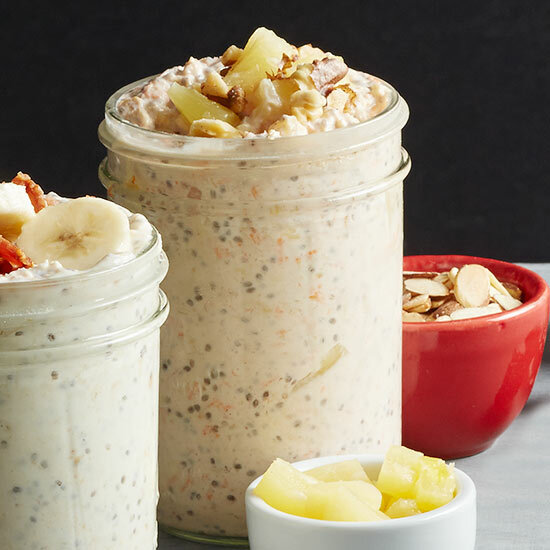 In a medium bowl combine yogurt, oats, milk, carrot, raisins, the 2 tablespoons pineapple, the maple syrup, nuts or chia seeds (if desired), and cinnamon. Transfer mixture to a pint jar with a lid or two half-pint jars with lids. Cover and chill overnight or up to 3 days. To serve, spoon oatmeal into a cereal bowl(s). Top with walnuts and additional pineapple.